Ivo was an excellent and informative guide and we had a splendid day. 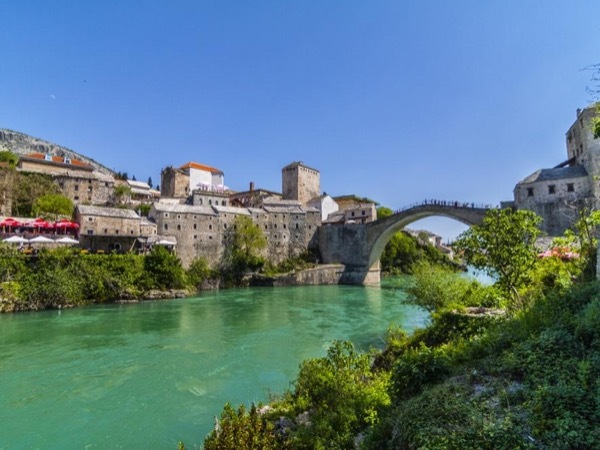 It had long been a wish of ours to visit Mostar and it was fabulous. Thank you. Ivo is a super guide. We requested a tour into Bosnia, since we had been to Dubrovnik several times before. He is very fluent in English. Knows all the slang. Easy to talk with. He made restroom stops in nice places. He handled the border crossing smoothly. He explained the history and current social attitudes of places we passed. As we are older and struggle with mobility, he minimized our walking and still gave us the viewsHe provided us exactly what we asked for including a lunch of local food. Bosnia-Herzegovina is a fascinating place and definitely worth a visit from Dubrovnik. The tour was well paced and gave you a wonderful snapshot of the country and its history. Ivo was everything you could hope for in a guide. Funny, charming and responsive to our needs, Ivo provided a unique insight into the area we would not have otherwise had. Our time with him and this tour stands out as a highlight in a holiday full of amazing sites and people. Thank you Ivo. Ivo was a wonderful guide. He provided valuable, insightful information and personalised service and was happy to answer any questions. He was flexible, allowing us to decide how long to spend in each location based on our needs and interests. He knew exactly how to time things to beat the crowds. Ivo also had a great sense of humour and kept us entertained for the entire car ride. The tour itself was wonderful - Such beautiful scenery, history and wonderful food! Ivo was great. Had great information on the Game of Throne's locations. Even if you are not that interested in Game of Thrones, which one of our group was, he made it just as interesting and entertaining for her. No doubt if we ever come back to Dubrovnik, we will definitely check on his availability. Also, Dubrovnik is an unbelievably clean and beautiful city that we all enjoyed - we just didn't have enough time to really enjoy the city. Ivo was very knowledgeable, personable and engaging. His excitement about Dubrovnik is contagious. We was great about giving us options on where to go & and what to see given our preferences, traffic conditions, etc. So we felt he really helped us to maximize our tour. He also pointed out scenes that would make good photographs and offered to take photos of my wife and I together a number of times throughout the tour. Touring with Ivo was fun. Ivo knew his stuff and was beyond sharp and witty. Made us laugh a lot while conveying his vast knowledge. Also a good driver, which on those mountainous roads, was a huge asset. Took us away from the swarm of people in Old City Dubrovnik, but also gave us essential information about Old Town. Very astute. Highly recommend. Very knowledgeable of the history of the region. Due to his experience with this tour, he was very skillful at avoiding the crowds. He brought the historic sites to life with background stories. He selected a great spot for us to sit and have lunch on the water. A good tour to Montenegro. We especially enjoyed the boat ride out to the small church. Kotor is beautiful and we had a interesting tour of a church filled with Roman artifacts. Ivo was a solid guide, punctual, a good driver, and helpful. We did have a bit of a communications snafu about getting some lunch. Luckily we found a pizza stand on our own and were satisfied. We did appreciate that he suggested leaving an hour early to avoid the border crowd. It worked. 5 plus stars!!! We booked this tour last minute and we are so glad we did. We went for a Game of Thrones tour and got so much more. Ivo was very engaging, and gave us a lot of information on Croatia. He is a credit to his country. We really enjoyed seeing the Game of Thrones sights, but left being more impressed by this lovely young man. He even helped us plan out the rest of our day! We will definitely go back!! I appreciate that the guides work long hours during the "high" season but it seemed Ivo was exhausted from numerous long days prior to our tour. Not his best effort. Korcula is #1 place to visit while visiting Croatia. Our guide Ivo was great, very polite, informative, helpful. We highly recommend Ivo for all your day trips. Our group of 8 people, had an amazing time visiting Montenegro with Ivo. Ivo is a great guide and driver. We highly recommend him. Ivo is a great guide, very knowledgable about his country's history and current events. We had over 3 hours each way (from Dubrovnik to Split) in the car, and the conversation was filled with fun facts and discussion. Split and Trogir are lovely towns, and Ivo was very flexible in giving us the time we needed to fully enjoy the visit. I can highly recommend him. What a fantastic tour to Mostar! Ivo is a complete legend! Ivo was prompt and welcoming picking us up from our cruise. He gave an excellent commentary as we drove to Mostar. His sense of humour made the tour. Ivo is so knowledgeable and was an excellent guide- he really looked after us. We would love to do another tour with him- this tour is one of the best we have ever done in all our years travelling. The Clarke Family aka Moonshine and Family! Ivo was brilliant - he has a fabulous sense of humour; he loves his city very much and is very knowledgeable; he was on time. I would highly recommend Ivo if you want to develop your understanding of the beauty and complexity of Dubrovnik whilst having a very positive time. Excellent day tour with an outstanding guide. Very interesting tour. Excellent guide. Fluent english and very knowledgeable about the area as well as very helpful throughout the day. So glad that we did the trip to Kotor and Budva. Perfect day trip from Dubrovnik. Ivo was pleasant and flexible. He even made an extra effort to get us to a viewpoint on the way back just in time to watch the sunset. This was a nice but long trip. Ivo as usual very informative. The man is like a little encyclopaedia. Trogir was really nice; the cathedral is a must. In Split we spent some time at the Diocletian's palace and the Cathedral of Saint Domnius. Both a must. I really recommend this trip. Great guide, Ivo was prompt and everything went smoothly. We missed any border queues and managed to avoid any crowds. The tour was excellent and gave a good introduction to Montenegro. I wouldn't hesitate to use him again. A nice and relaxing trip along the coast. We had some fresh oyster tasting on the way. We had some good time in Korkula Island, including shopping. On the way back we went for wine tasting and a tour of the winery. A very long journey. Ivo was right to start at 7AM to avoid being caught at the border post. Incredible views of the Montenegro coast. Perast and the Island of the Lady of the Rock was nice. Kotor is a nice old town (again rain caught up with us). We ended up in Budva where we had lunch at a very nice location. I recommend this trip for sure. We had a great time on our tour with Ivo! He was personable, professional and full of interesting stories and anecdotes about the areas we travelled through. We enjoyed the boat ride to the oyster farms and the delicious little meal as well as our stops at Ston and the botanical gardens. The drive up the Napoleonic road gave us a great overview of the Elaphiti Islands and the beautiful coastline of Croatia. Ivo also told us about an interesting bar near our hotel. A fun & relaxing day. Highly recommend! TOUR GUIDE RESPONSE: Thanks guys.Hope to see you again one day. A long journey but very interesting. Medjugorje (apparitions of the Virgin Mary), Mostar and the water falls in Kravica a must. A pity we got some rain in Mostar but not Ivo's fault. It was very good. We got to go around Dubrovnik and we were taken to a really nice restaurant in a really good setting. Some marvellous views of Dubrovnik. This tour a must. Great tour, quite informative but lots of walking. We only did half of the tour (got tired). The views are quite something. I would recommend it. We loved this tour. Ivo is an extremely knowledgeable and entertaining guide. He was prompt on meeting us at the pier and got us back with time to spare. Mostar was beautiful and worth the drive to get there. Lunch was fantastic and we would recommend this tour and this guide to everyone. Our tour of Mostar with Ivo was teriffic! He gave us such a fascinating overview of the area, some of which we knew. But he blended his personal history, which was important, given the tumult in the past. Very interesting, I appreciated his willingness to share. The roads to Mostare are small�� which are kind of fun and it's kind of interesting to go through the different ethnic townships...they still exist after the war, very interesting! Mostar is definitely worth a visit if you have DONE Dubrovnik. TOUR GUIDE RESPONSE: Hi Beth, I also had a great time and I really enjoyed on our tour.Come back again because there is plenty more to see and do. Ivo C. was very knowledgeable about the interesting city of Dubrovnik and the history of Croatia. He was sensitive to the diversity of the group (ages 5-75) and the desire of some to walk around and for others to sit and enjoy. He made it possible for both/all to enjoy. TOUR GUIDE RESPONSE: Thank you Madeline.I am glad that you all enjoyed and had a wonderful time.I also hope that you will come back to Dubrovnik and stay a little bit longer. This was a wonderful tour. Our guide, Ivo, was fantastic . He was very knowledgeable about Montenegro and was very eager to make sure our tour was enjoyable. He has the perfect disposition for someone you will be with the entire day. We had an incredible lunch at a local restaurant overlooking the Adriatic that was one of the highlights of our trip. We enjoyed Ivo so much that we booked him again a few days later for a full day trip to Ston and tour the wine country and eat the oysters. First class guide! TOUR GUIDE RESPONSE: Thank you Bubba! Big hug and regards to Sophia, Minkee and Elioth too. We had Ivo as our tour guide in Dubrovnik as well as Split. Both times, our group of 18 had a wonderful time with Ivo, as if he was a long lost friend. We booked a private tour with him in Split and once again, he was knowledgeable, flexible and fun to be with. We had a nice ride a new Air conditioned Mercedes Benz mini-bus. We highly recommend him and will book with him again without hesitation. TOUR GUIDE RESPONSE: As I said for the tour of Dubrovnik this was also great.And you cannot call your group seniors because you were like teenagers especially the guys.Tell them that I miss them. Ivo was an excellent tour guide for Dubrovnik, Croatia. He was very knowledgeable, flexible and had an excellent sense of humor. We book a private tour with Ivo; there were 18 of us mostly seniors with different needs and wants but he was able to shepherd us along with no problem. Our ride was an almost brand new Mercedes Benz with AC that could fit 18/19 people. Everyone in our group totally enjoyed our time with Ivo. We will not hesitate to book with him again. Ivo's "GoT" tour for 6 of us was also spectacular! (See my review of this gracious, charming, spirited, & FUN driver/guide's same day "Dubrovnik Essentials Shore Excursion.") He assisted the GoT crew in a variety of stunning locations, so he had lots of interesting inside info about the many beautiful settings we explored (& photos of GoT enhancements vs. the restored state). The finishing touch: a great dinner at a table he reserved by a natural waterfall at a forest restaurant with local wines & food. On the very busy national holiday our cruise ship called at Dubrovnik, Ivo managed to avoid most of the heavy traffic & crowds to provide 6 of us (3 couples) an outstanding tour of a great number of different important, interesting sites—both in the city & countryside, where he curated many fabulous photo ops. He was a most gracious, charming, & FUN driver/guide, with passionate, thorough, insightful historical, political, & cultural information. We never felt rushed, even though we saw & learned so much! Fascinating and most interesting tour which we thoroughly enjoyed. Ivo is an excellent guide. My husband and I, along with another couple just returned from an amazing trip to Croatia. We did a tour with Ivo to Ston, Kocula and the wine country. We had a fabulous time. Ivo was hilarious and very personable. He arranged some awesome tastings for us and took us to some spectacular view points. We thoroughly enjoyed our tour with Ivo. Ivo was an excellent and very knowledgeable tour guide. We thoroughly enjoyed our day with him! Wow what a wonderful day we had with Ivo! Extremely personable and knowledgable you man. The tour was everything and more than we expected and dinner in a mountain 'tavern' was icing on the top. Don't miss this opportunity. Excellent tour. Well organized, creative presentation, beautifully executed. Ivo is a very knowledgeable young man. Fluent in English, funny and courteous. Very skilled driver. My husband and I truly enjoyed our day with him. We had a great day with our guide Ivo! He had the day well planned. Ivo's English is very good which made for easy conversation throughout the day. Highly recommend booking a tour with Ivo! My family rated Ivo as their favorite guide out of 15 tours on our 3 week trip. My kids said he seemed like a friend by the end of the day. Ivo definitely went beyond the tour description and changed the itinerary when he heard the interests of the group. Really the best! Our tour guide Ivo was truly wonderful and made our last day in Croatia our best! He went out of his way to customise our tour for us and took us off the beaten track to get away from the crowds which is just what we wanted. From freshly picked oysters to perfectly cooked mussels, to boutique winery visits...this was a truly wonderful day. The cherry on the top was visiting a Mlicini Ano, a little farm in the mountains where we ate freshly made cheese, homemade wine, honey, and the best lamb in Croatia! Ivo is the best. Knows his country side and where to go for a memorable day. The wine tastings , the fresh out of sea oysters , and the boat ride to Korcola and the lunch stop couldn't be better. Ivo was the best guide we ever had...truly the best!! Book him for everything you do in and around Croatia, including Montenegro and Bosnia. We booked him for 2 days, but saw him for 5. We had more fun than can be described in the allotted space. Ivo went way above and beyond what could be asked as he provided extra care for my wife who has a disability. By the time we left, we felt like we were saying good bye to family. If you book Mostar, have Ivo take you for breakfast & wine tasting at Hotel Bastina! Ivo was the best guide we ever had...truly the best!! Book him for everything you do in and around Croatia, including Montenegro and Bosnia. We booked him for 2 days, but saw him for 5. We had more fun than can be described in the allotted space. Ivo went way above and beyond what could be asked as he provided extra care for my wife who has a disability. By the time we left, we felt like we were saying goodbye to family. If you book Montenegro, visit Budva for lunch at Ivo's spot on the water. Ivo C. is the proudest Croatian we have ever experienced. Ivo certainly is a wealth of knowledge. At times his ethnocentrism and ambition could come down a notch or two. We felt safe and comfortable with Ivo. He certainly knows Mostar. Would we use Ivo again - yes. This was a fantastic tour, of course, we were very fortunate that the weather was perfect! We stopped at several vineyards for wine tasting in addition to the oyster outing. We are experienced travelers and this was one of the most memorable tours ever. if you are thinking about this tour, just do it! We enjoyed spending the morning with Ivo. The sights were beautiful but most importantly Ivo was a wealth of information about the history and culture of Croatia. Perfect day. Ivo was a wonderful, knowledgeable guide. He had pictures of scenes from the Game of Thrones which he showed us when we reached the locations where the scenes were filmed. Other tour guides asked to use the pictures to show their guests! He was very enthusiastic and it was apparent that he loved his country and his job. It was a great tour! Unforgettable and unique adventure with Ivo! Our group of 6 was met right on time by Ivo. The van was clean and air conditioned. As we drove to Ston, Ivo explained about the area and the culture of the Dalmatian coast. We took a little boat to a private island and learned about oyster and mussel farming. Then we sat at a beautifully set outdoor table and were served a heavenly meal of fresh oysters and steamed mussels in white wine and garlic. Homemade wine and bread! So much fun! So unique! Ivo was great! Picked us up promptly from airport & helped coordinate with apartment owner, luggage etc. all with a smile. He picked us up for trip to Montenegro which was an over the top bonus day! Stunning scenery-he provided spectacular photo ops! Drove up a mountain of 25 switchbacks to find a great restaurant with fresh local dishes! He ordered for us with excellent recommendations-all delicious! Climbed 450 steps to the top-stunning . Sunset vistas before taking ferry back. A fantastic day with Ivo! Ivo arrived on time and did exactly what we wanted. He was terrific and took us to see Trogir, etc. We also had a delicious lunch at Mila Ston, a seaside town near Dubrovnik. He gave us excellent restaurant recommendations, most of which we tried with great success. Proto was especially good, the subject of another review, as was Orhan. Ivo was terrific! We thoroughly enjoyed the entire day and will always remember the war museum and lunch. Thanks so much for sharing yourself and your country with us! Not a tour, but a hotel transfer, just as described. A helpful and courteous service, which saves a great deal of bother, especially if your hotel is in the old town. We just returned from Dubrovnik, Croatia where we met Ivo. He is a licensed guide and is wonderful. We were able to see all the sights that we wanted to see. He made Dubrovnik come alive. We felt very safe as he drove into the mountains. He clearly explained the history of the area. Ivo dropped us off in Old Town and let us wander on our own and then later picked us up and took us back to the ship. It was fantastic!! His command of English was outstanding. Thank you Ivo and Toursbylocals. TOUR GUIDE RESPONSE: Thank you for all, Dan, I'm glad that I could enrich your day. Say hi to Greer, Dave, Kelly, Tom and J. You were great company. Please know that we were very pleased with the services Ivo provided to us. He was knowledgeable, charming, and very accommodating. My group would give him the highest rating available. We had a through tour but I would not recommend large groups with any tour guide. Keep it small (6 the most) so that you can move through this area much easier. TOUR GUIDE RESPONSE: Hi Malvina, Dubrovnik essentials tour includes walk through the old town (1,5 km approximately, as it is pedestrian zone only) and it gets very crowded sometimes. Thank you for understanding and wish you all the best. Ivo was waiting for us even though our flight was late and got us where we needed to go on time. TOUR GUIDE RESPONSE: Thank you David, our job is to deliver full service even in case when things do not go as planned. I am glad that you had good time in Dubrovnik, take care. This was a fabulous tour! Ivo was great - very knowledgable, great English. Our oyster experience ranks as one of our favorites from our 2 week cruise of the Mediterranean. We are from Louisiana and eat plenty of oysters and were told that we may not like the Croatian oysters as much, but they were great size, plenty salty and the whole setup in Ston was fabulous. As a bonus we also ate fresh muscles cooked with local ingredients that may have been one of our best meals on trip. Thanks Ivo!!!! TOUR GUIDE RESPONSE: Thank you so much on these compliments. You were great company and I hope your friend is getting better. TOUR GUIDE RESPONSE: Larrie, thank you so much for the kind words. Glad that you had such a great day and that the tour gave you everything you needed. Wish you all the best. TOUR GUIDE RESPONSE: Brand, thank you for taking the time to provide rating. Take care. TOUR GUIDE RESPONSE: Thank you Brand. Ivo was an excellent tour guide.. Extremely knowledgable, courteous, and professional. We were a group of eight on this shore excursion of Dubrovnik... Awesome and breathtaking sights!! TOUR GUIDE RESPONSE: Thank you Carole, wish you all best. We had an excellent tour of Dubrovnik and surrounding countryside with Ivo, who was knowledgeable, polite, and fluent in English. Thank you, Ivo, for sharing your spectacular country with us. We enjoyed being with you for the day! TOUR GUIDE RESPONSE: Virginia, thank you so much and I wish you all the best. Fun, knowledgeable, thoughtful. We really enjoyed the tour. TOUR GUIDE RESPONSE: Thank you Rosemary, take care. TOUR GUIDE RESPONSE: Thank you so much for the kind words Judy – they are much appreciated, you were such a pleasant company and I had great time too. Greetings to Rick and all the best! Ivo was good. He spoke good English. He managed our group of 7 well.We had 3 teenagers.Walking tour of the walls was beautiful and the history behind it interesting.The town of Dubrovnik was beautiful and Ivo gave us a good sense of the main areas of the Old Town. TOUR GUIDE RESPONSE: Elizabeth thank you very much and I wish you all the best.